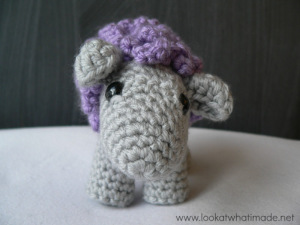 This little crochet sheep is another collaboration between the talented Anette Bak and myself. It is part of our Little Zoo Series and I think it might be my new favourite. 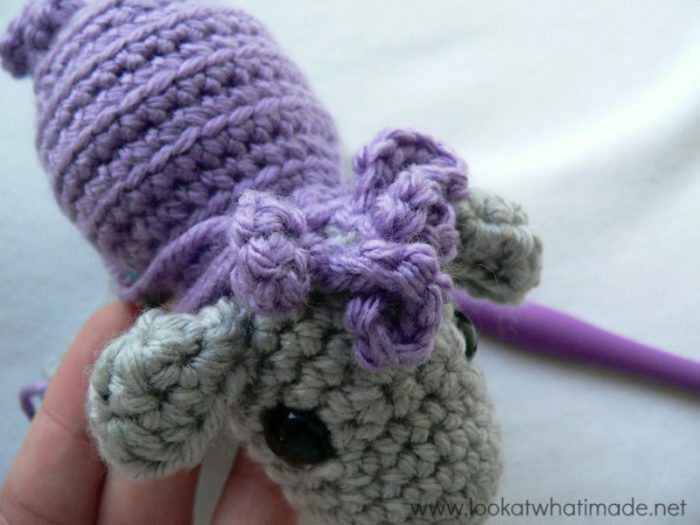 The ears and legs are joined as you go, meaning that there is very little sewing involved. There are, however, a LOT of curlicues to be made. Strictly speaking you could leave Shorn…erm…shorn (naked), but he does look super cute all fluffed up. The light blue sheep above is quite puffy. This is because I misunderstood how Anette wanted the curlicues made and ended up making twice as many as I should have. I call him my popcorn explosion and he is partly to blame for my sore finger becoming even more sore! I hope you have great fun making your very own Shorn (or Sharon, if you prefer). If you would like to print this pattern, please use the print-friendly button at the bottom of this post. You can then choose which photos to exclude from the print-out. Please note that the instructions for the legs are on a different page (link below) and you will need to print them out as well. Please Note: I have used Deborah Norville Everyday Mist as my Main Colour, and Orchid and Baby Blue as the respective Contrasting Colours. 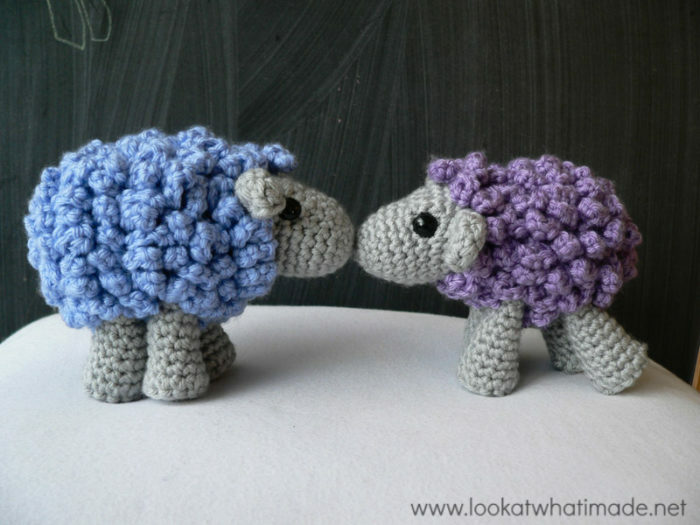 Using the hook and yarn specified, your sheep will be about 12 cm (just under 5″) long, and 9 cm (just under 4″) high. 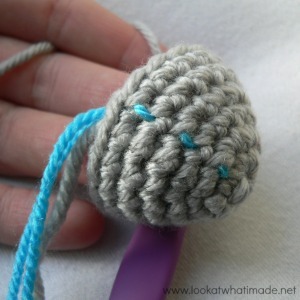 RSM – Running Stitch Marker: Place a piece of scrap yarn over your work before making the first stitch of the next round. 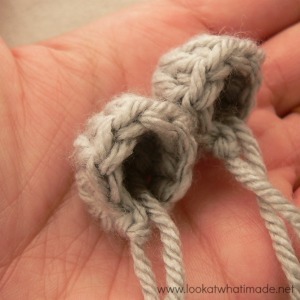 Flick this piece of yarn backwards/forwards over your work at the beginning of each new round. The yarn will form a running stitch up your work, which will help you keep track of the start of each round. When you are done, simply pull the yarn out. We will be referring to this RSM, so please use it. Curlicue – Ch 3. Make 4 sc’s in the second chain from the hook. Make 4 sc’s in the last chain. Make 4 legs using THESE INSTRUCTIONS. Use Main Colour for the legs and Contrasting Colour for the feet. Alternatively use your Main Colour for the legs AND the feet. Skip the first 2 sc’s of Round 2 and sl st in the next st. Ch 1 and bind off. 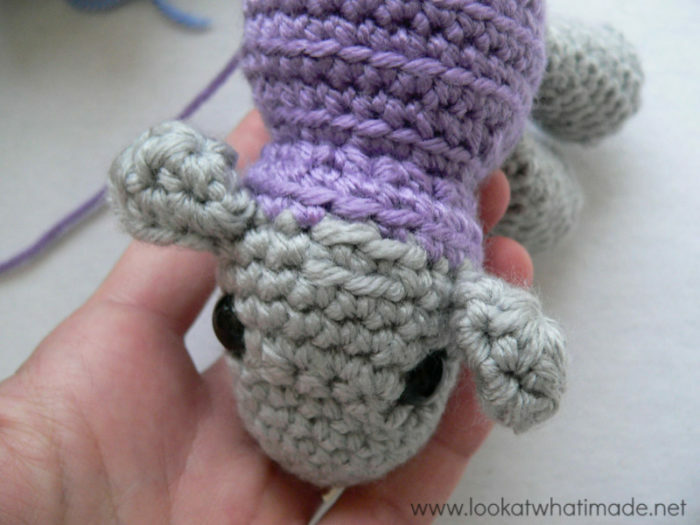 The ears are meant to be bowl shaped – they are to be folded a bit when they get crocheted on to the head. Make sure to work away the initial tail of yarn from the magic ring to be invisible and to end up very near the final tail of yarn. That way both ends can be tied together and placed inside the head when crocheted onto the head. Bridge Row: Sc in the next 9 st’s. Sc in the blo of the next 2 st’s. Sc in the next 9 st’s. Move RSM to this new starting point and leave the remaining 2 st’s of Round 12 unworked. Before you continue, have a look at your sheep’s head. There should be a tiny square of front loops right in the middle of it’s forehead formed by the 4 blo stitches in Rounds 12 and 13. Fold the ear. Place it in front of the head and upside down, with the opening pointing to your right (left if you are left-handed) – see Photo 2 above. Make your first sc through the stitch just before the sl st bind-off on the ear and the next st of the head (2 layers). Make the second sc through the stitch after the sl st bind-off, the second stitch after the bind-off, and the next stitch of the head (3 layers). Fold the ear. Place it in front of the head and upside down, with the opening pointing to your left (right if you are left-handed). Make your first sc through the stitch before the sl st bind-off, the stitch after the sl st bind off, and the next st of the head (3 layers). Make the second sc through the second stitch after the bind-off and the next stitch of the head (2 layers). When making the body you will need to work into the back loop only (blo) for some stitches, and into both loops (as standard) for others. To help make it easier for you to know when to work into the blo, we have made the blo instructions bold. Bind off, leaving a 100 cm/40″ tail of yarn. This is overly generous, just so you know that I know this. But I would rather you waste 10″ than be 1″ short. Take the long tail of yarn from the end of Round 12 of the body and weave it through the last 6 stitches. Pull them tight to close the hole. Insert your hook around the “hole” by poking it into the sheep on one side of the closed hole and out the other side (Photo 4). Yarn over with the long tail of yarn and pull up a loop. Ch 8. Make 3 sc’s in the second chain from the hook (Photo 5) and each of the remaining 8 chains (including the loop you pulled up to start with). Fasten off and work away your tails of yarn (Photo 6). 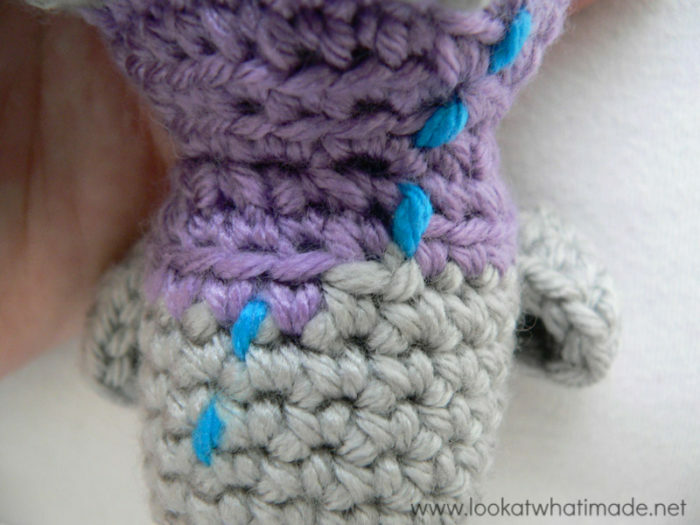 The fleece is added by making curlicues into the front loops only of the indicated stitches. These front loops (flo) will form little ridges around the sheep’s body, making them easy to identify and work into. The notes below are based on the body having been made with the exact blo as described above. There are 88 curlicues to be made! When making your curlicues, please note that the curlicues should fall in every second stitch (unless specified). When making the 2 sl st’s between curlicues, the second sl st will form the base of the next curlicue. Each “repeat” should therefore fall over 2 st’s, not 3. Turn your sheep onto his/her back with the head facing you. You will be starting your curlicues in the front loop of the second to last stitch of Round 12 of the head. This will be the only MC (Main Colour) front loop under the sheep’s neck/chin. With a slip knot already on your hook, join your CC (Contrasting Colour) yarn by making a sl st in the MC front loop specified. Ch 3. Make 4 sc’s in the second chain from the hook. Make 4 sc’s in the last chain. This is your first curlicue made. (Sl st in the next 2 st’s and make a curlicue) 4 times. Sl st in the next 2 st’s. The last sl st should fall in the CC front loop directly to the right of the 4 MC front loops (to the left if you are left-handed) – see the large arrow in the photo below. Make a curlicue. Sl st in the next CC front loop (which should be the CC front loop above the back right MC front loop). Sl st in the back right MC front loop on the forehead (back left if you are left-handed). Make a curlicue. Sl st in the front right MC front loop (front left if you are left-handed). Sl st in the front left MC front loop (front right if you are left-handed). Make a curlicue. Sl st in the same stitch. Sl st in the back left MC front loop (back right if you are left-handed). Make a curlicue. Sl st in the CC front loop directly above the last sl st. Sl st in the next CC flo. This is the fiddliest part of making the curlicues and it is behind you now. Congratulations! 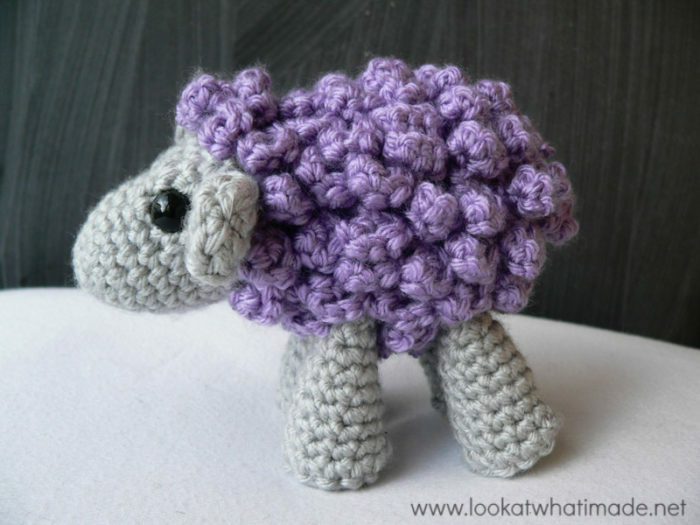 We hope you enjoy making, and playing with, your little crochet sheep. Hi. Round 3 starts with a sc inc (single crochet increase). Hello Dedri, I love this sheep. I have made two of them now, both times I have not ended up with the same amount of curlicues as you do, what could I be doing wrong? Hi Christine. Can you give me more information so that I can help you? The number of curlicues isn’t a deal-breaker, though, so if your sheep look fine, I wouldn’t worry about it. But I am happy to investigate. Hi Tricia. Your little sheep is so cute :) I just went on your blog for a little spy and saw the photos of the lynx. Wow! Hi. What is meant by “short row (inside) and short row (outside) on head portion? Short rows are rows that do not begin and end where rows traditionally begin and end. They help shape items three-dimensionally. There’s something wrong with the instructions for rows 9, 10, and 11 of the body as copied here. Following the word “six” in each line, something is missing, and I’m not sure what. The word “six” is also bolded so I’m not sure what, if anything, should be done in blo. Hi Heather. Thank you for bringing that to my attention. The word ‘times’ was inadvertently removed from those sentences. They should all read ‘6 times’. This has been amended now. You might need to clear your browser cache in order to see the changes. Hi! Thank you for all the lovely free patterns and tutorials! I recently discovered your blog and have already made Charlotte. The instructions were real clear and easy to follow. Unfortunately I have a problem with row 13 of the head (the bridge row). I’m not sure what to do when you say to leave the remaining 2 st’s unworked. Do I skip the last 2 stitches and sc in to the first sc from the beginning? But then I have 20 stitches to work with for the row 14 and not 22. Or do I chain 2? Hi and thank you for your question. The bridge round stops 2 stitches earlier than it should so that the remaining rounds could be more easily written. Otherwise the instructions for attaching the legs would have been split over 2 rounds each, instead of only 1 round. So as far as crocheting into each stitch, nothing changes. We are just moving the start of the rounds by 2 stitches. After you have made all the stitches for Round 13, move your running stitch marker to this point (so 2 stitches in front of where it used to be) and start with Round 14 in the very next stitch. The first 2 st of round 14 will now fall in those 2 unworked stitches. I hope that makes sense. I love this sheep! I made 2. One for my 5 year old son and one for my 4 year old daughter. I am pretty sure holding the sheep Mommy made, while counting sheep to fall asleep has helped them fall asleep faster and stay in their own beds longer at night :). Thank you for sharing this pattern! I made this pattern and just loved it. I too found the curls a little hard on the hands but just too cute to quit. I made this for my granddaughter who is 20 months old and she loves to cuddle it. My grandson who is almost 7 wants one too. Hi, I just finished making the head of my sheep and noticed that all of my back loop stitches are on the wrong side. I double checked my stitches but I’m not sure. 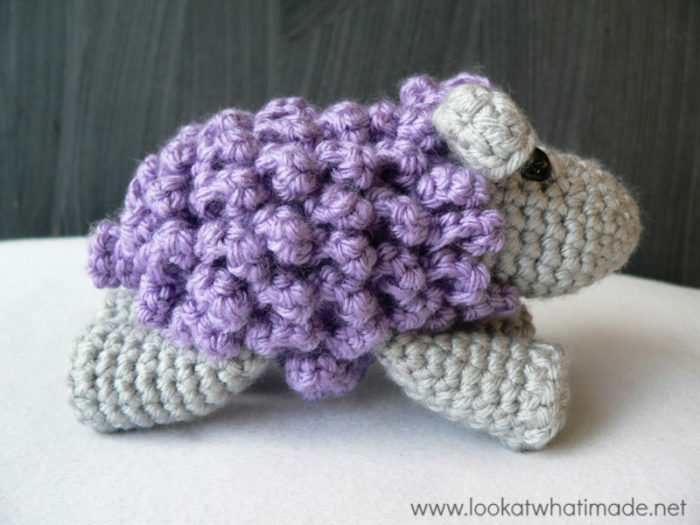 Am I crocheting in the loop closest to me or farthest away? I chose the one farthest away, which puts the ridge on the inside. Molly, if you are crocheting into the loop farthest away from you, which is the back loop, your remaining loops (front loops)should be on the outside of the head. 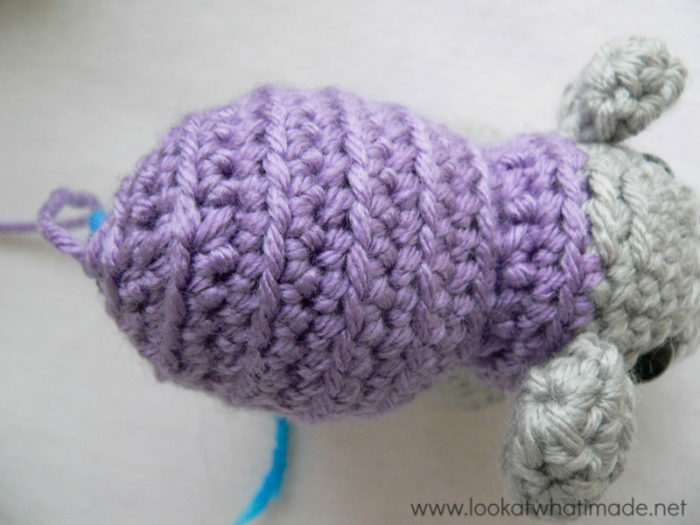 Tell me this: when you crochet, do you crochet around the outside of the head, or the inside. In other words, when you hold the head with the “hole” facing you…do the stitches around the hole go clockwise or anti-clockwise? If they go anti-clockwise it will indicate that you are working with the right side of your work facing inside, not outside like it should, and you will need to turn your work inside-out and continue. I can not get this pattern to print. Any ideas? The print friendly button doesn’t seem to be working. Hi Chyrl, I just tried it and it worked for me… Can you tell me more about the problem you are having and I can try and help you more effectively? Just finished your dinosaur puzzle ball. Hard to make, but great result. Can’t wait to start this cute little sheep, I love it! So So Cute. The minute I’m having some spare time I working on this adorable sheep. Hope it’s not too hard I am a bit out of practice. Thanks !